I'm available by phone almost all the time. Just leave a message if I don't answser. We are your full service bookkeeping, tax preparation, tax planning, tax representation, and strategic consulting firm. 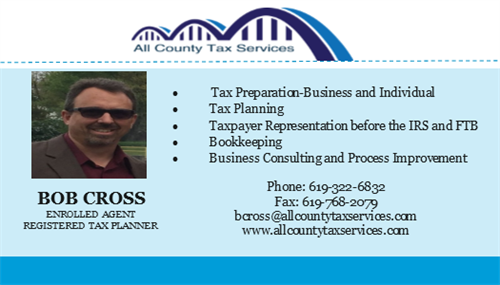 Our specialty is personal and small business tax preparation and tax planning. Our goal is to help you reduce your year end tax bill to as low as legally possible by helping you strategize your annual tax planning and then coach you through the process. We help families establish and follow their annual budgets, and help businesses with their strategic planning and execution. Need Help With the IRS or FTB?